or special event at Kpacho. WHAT FUN… Kpacho, living up to its meaning, is regarded as one of the most popular Mexican restaurants in New Hyde Park. Kpacho offers fresh ingredients where traditional recipes are presented with a modern twist. There is an extensive cocktail menu featuring premium tequilas, and an array of signature margaritas and uniquely crafted drinks. We welcome large groups celebrating any occasion to choose from our many menu options. Kpacho was created with a desire to serve the neighborhood great Mexican in a quick, casual and fun environment. Celebrating a big Event? Kpacho is the place to cater your office holiday party, Sweet 16, Bar / Bat Mitzvah, wedding or shower. We offer a full catering facility on our lower level, to meet all your needs. If you’re looking to improve upon your skills, or just get some skills – look no further. Join us every Thursday evening for complimentary Latin dance lessons by Kpacho’s very own dance instructor. Learn how to Salsa, Bachata, Tango y mas! Whether you’re an amateur or an advanced salsa dancer, patrons of all skill sets flock to bust a move to our live performances each week. If you’re new to salsa dancing, partake in an in-house lesson and get ready to show off. Come early and enjoy dinner before heading to the lounge and dancing the night away! 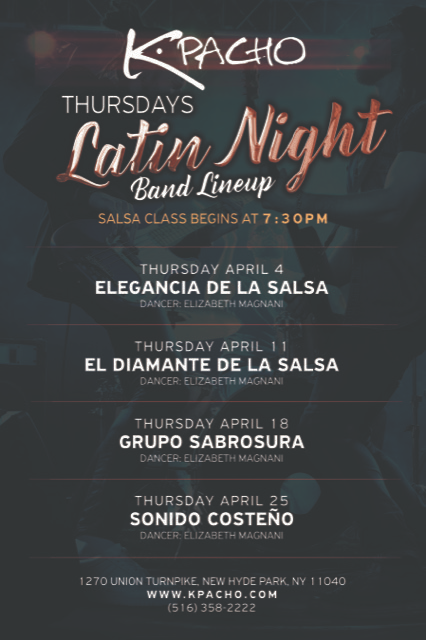 Salsa lessons begin at 7:30pm, band begins at 9pm! Impress your guests with Kpacho’s event space, ambiance and our over the top selections of food. K.Pacho can host a variety of private events in both the ground floor restaurant and the lower level Catering facility. and Bar/ Bat Mitzvahs, Kpacho will make sure your guests leave with a memorable impression.